We very much appreciate this opportunity to present the other side of a very complex narrative. The Women of the Wall have cast this as a battle over religious freedom, when in reality its a disagreement over religious theology. They have cast it as a fight between “fundamentalist,” ultra-orthodox rabbis against women, when in reality it is a disagreement between women (and men) who care deeply about tradition, and a small group, motivated by feminism, who want to make unilateral changes in the most sacred site to Judaism today. As a Jewish woman, there are two things that are most important to me: My fellow Jewish brothers and sisters, and tradition. Throughout our two thousand year exile, the one thing that held our nation together, and enabled us to survive despite our being scattered around the globe, has been our dedication to our heritage and tradition. The site of the Holy Temple in Jerusalem has been the focus of our prayers since it was dedicated by King Solomon nearly 3000 years ago. The Western Wall and the Temple Mount behind it are the place to which all Jews pray, around the globe. It is both the epitome of holiness, and the place that unifies the entire Jewish nation. I, together with Leah Aharoni, founded Women For the Wall in April of 2013, a grassroots movement of women dedicated to preserving tradition and unity at the Western Wall. We were inspired to start this movement because of the hateful rhetoric and behavior of the Women of the Wall. To the media and in speeches worldwide, Anat Hoffman and other leaders of Women of the Wall have compared Israel to Saudi Arabia, claiming that women cannot pray freely in the Jewish state. 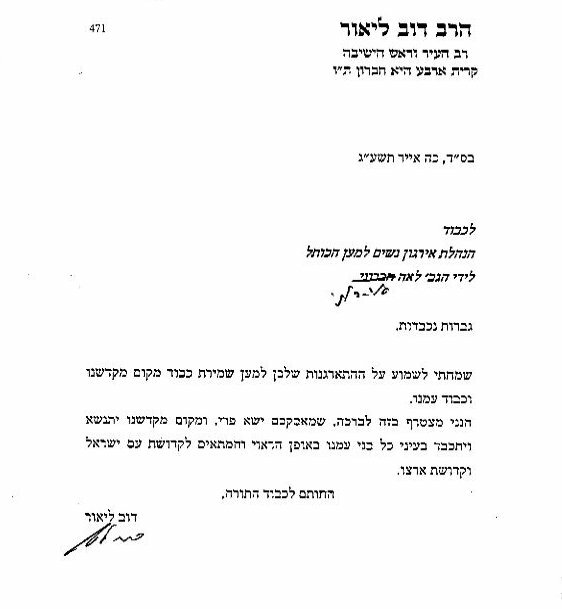 In other articles and quotes, they express their view that traditional women are oppressed, religious men, misogynist, and their prayer at the Wall, an opportunity to show traditional Jewish women how they can “take control of their own religious lives.” This rhetoric of incitement against religious people has culminated in recent days with death threats against the Chief Rabbis of Israel and the Rabbi of the Kotel. We are very much in control of our own religious lives, no thanks to the Women of the Wall. We find their rhetoric and condescension offensive, and their behavior an affront to the sanctity of a Holy Place. Jewish unity is very important to us, and it pains us to see a small group of women insisting on causing such disunity and infighting in the Jewish world. By using the slogan that they’re “Liberating the Kotel,” they’re creating a language of confrontation. The Western Wall was liberated from the Jordanians in 1967 – from whom are they trying to “liberate” it? Traditionalists? Well, yes, but they claim that’s just the bearded Rabbis. We are here to point out that they are trying to “liberate” the Kotel from the vast majority of women who pray there. The Women of the Wall are insisting on making unilateral changes at the Kotel, the one place that has kept us unified as a nation, specifically because of our adherence to tradition there. Everyone is and always has been free to pray at the Western Wall, whether Jewish or not, religious or secular. It is the holiest place in the Jewish world today, and just as every sacred site in the world has rules and expectations governing conduct there to preserve an atmosphere of sanctity and reverence, the Kotel has rules of conduct there, and even a Rabbinic authority to maintain the holy atmosphere. The Women of the Wall claim that this is a fight against “ultra-Orthodox Rabbis”, and that what they are doing is in line with halacha, Jewish law. The fact is that there is no such approbation for what they are doing – and they lie well outside not only Orthodox consensus, but Israeli consensus as well. And needless to say, their practices diverge from the consensus of Jewish history, from thousands of years of tradition in Jewish prayer. Women For the Wall has support from across the religious spectrum in Israel, from secular, traditional and fully observant Jewry, and all of them were represented at the Kotel last Rosh Chodesh, 10,000 strong, demonstrating their support for tradition at the Kotel. We have the approbation of a coalition of outstanding Jewish religious leaders across the spectrum of Judaism as practiced in Israel. Women of the Wall claim to be fighting for women. Were this true, would they not take into account the rights and wishes of the vast majority of women praying at the Western Wall? Would a group that truly cared about women be so derisive towards traditional women, calling them oppressed, repressed, and dependent? I hesitate to bring this up, but HaAretz – after refusing to speak with us about the issues – ran a blog piece that was little more than character assassination against myself. Women of the Wall posted a link to this article and called it “Honestly exposing WOW’s ‘opposition’.” Does that sound like a group that cares about women – or only those women who agree with their agenda? Religious freedom is something dear to us all – no one wants to be forced into do things that they are opposed to, in the name of religion. The converse also holds true – liberal coercion is just as wrong – no one should be forced into giving up the values they hold dear. Women of the Wall make the story at the Kotel into an issue of religious coercion; in reality it is an issue of their effort to coerce changes upon those of us praying at Judaism’s most holy site in full accordance with Jewish tradition. For the sake of allowing everyone to be able to practice their faith in the way that is dearest to them, and in an environment that makes it comfortable for them to do so, The Robinson’s Arch section of the Western Wall was set aside as a place for non traditional prayer services by the Supreme Court, and the Kotel Plaza section of the Western Wall for traditional prayers. Everyone is welcome at both, but everyone is expected to respect the atmosphere in those specific places. The Israeli government spent 2 million shekels fixing up Robinson’s Arch, and Natan Sharansky has offered to make it even larger, although the Women of the Wall have not once mustered up numbers that would justify that expense. Women of the Wall turned down that compromise, calling it “irrelevant,” and stating that they are interested in praying only at the traditional women’s section of the Kotel. 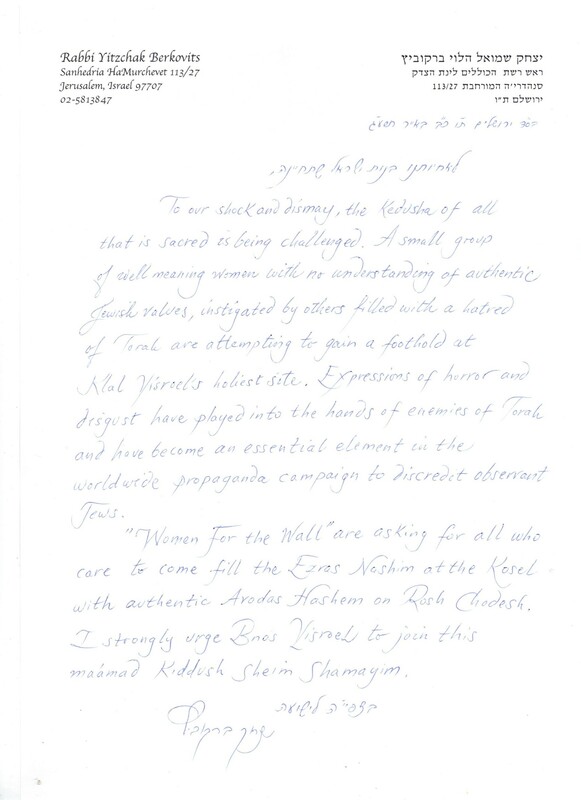 Freedom of religion needs to go both ways, and unfortunately, Women of the Wall, by rejecting Robinson’s Arch as a place of prayer, are saying that only their freedom of religion is important. The freedom of religion of the vast majority of those who come to the Kotel, the traditionalists, is irrelevant. They have shown they are not interested in compromise, just imposing their will on everyone else. Why must they pray at the plaza, and not at Robinson’s Arch? They claim that they just wish to pray, and as a women’s prayer group, want to pray only with women. Of course, they could easily divide at Robinson’s Arch. Of course, they did not divide, but prayed mixed, on Rosh Chodesh Sivan, as we all witnessed. But more to the point, the claim that they just wish to pray masks a different agenda. As two core founders of WoW, Rivka Haut and Susan Aranoff said recently in a Times of Israel op-ed, “WOW models to all Jewish women who pray at the Kotel that women can take control over their own religious lives. When Haredi women… see what WoW is doing, their world view is changed. Like it or not, this may initially shock them but then, when they get used to it, it will, it has to, change their world view. This represents a revolution in haredi lives. That is why they fear and resist it. Their women will be influenced, strengthened, perhaps even demand change from their rabbis.” In other words, they want to pray specifically with traditional women, in a way that offends traditional women, because they think their way of life is better and they want to influence traditional women to change. Anat Hoffman echoed this herself. After 10,000 women, including seminary girls, came to pray on Rosh Chodesh Sivan, she said: “The rabbis who sent them don’t understand that some of them will be asking, ‘Why not me?’ It’s a very subversive question.” It’s not just about them wanting to pray. It’s their desire to be subversive, to destabilize, to change our beliefs. That is why they’re not interested in praying in a way or in a place that won’t offend others – on the contrary. They want to shock, offend, and ultimately to subvert traditional women. Need we elaborate upon how outrageous and offensive this is? Women of the Wall are not victims of oppression; they are advocates for upheaval. Anat Hoffman’s goals, beyond what I have already said, extend to changing how the government handles religion in Israel, from marriages and conversions to divorces and burials. This, too, is echoed by members of Women of the Wall on both sides of the Atlantic. Their goals are political, not prayerful. The Western Wall should not be turned into a political battleground and media circus, and religious articles such as tallitot, tefillin, and prayer books should not be props with which to promote a political agenda. Political fights should be taken to the Knesset and the Supreme Court, and Holy Sites should be revered – not used as wedges to drive political issues. They are engaged in political provocation at the Western Wall, and that must end. Peace, harmony, and Jewish unity depend upon it.